Come for ranges. Stay because of the experience! Our facility is FULLY AIR CONDITIONED, state of the art, clean, and inviting. Our staff is friendly and knowledgeable. At The Orlando Gun Club, we strive to provide you with the ultimate shooting experience. Whether you’re a first time shooter, an avid hobbyist, or firearms expert; Our facility, staff, and services are available to meet your needs. The Orlando Gun Club offers a full line of firearms and firearm accessories for sale.Our product selection is wide and our prices are the lowest in town! We sell product by: Smith & Wesson, Glock, Springfield Armory, Colt, Daniel Defense, Remington, Khar, Sig Sauer, Bushido Tactical, Arsenal, LWRC, Trijicon, Aimpoint, Eotech, Magpul, Pitbull Tactical, Comp-Tac, among others. Stop by our showroom today to see what’s in stock. Or buy guns online now! The Orlando Gun Club also offers a variety of Class III or NFA items for sale Suppressors, short barreled rifles & short barreled shotguns. From brands such as: Advanced Armament Corporation, Silencerco, Daniel Defense, Noveske, and many, many more. Although we are open to the public, we have a wide range of membership options that can save you tons of money!!! See our membership options on our OGC Membership Page. Orlando Gun Club is FULLY AIR CONDITIONED, state of the art, clean, and inviting. The facility is designed with sound reduction insulation systems to reduce the concussive nature of firearms typically found at most indoor ranges. 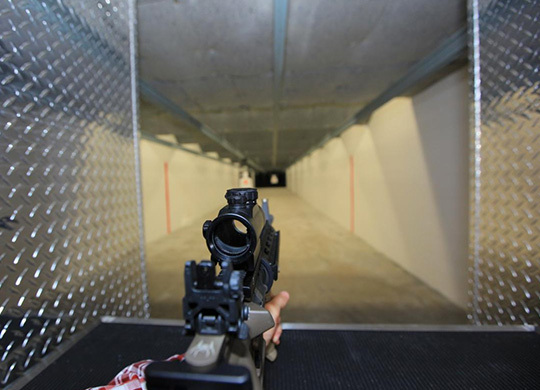 The OGC offers the best indoor live fire range experience available in Orlando. Try our fully air conditioned 50 yard rifle range (the longest in town) or 50 foot pistol range today! More information about our ranges can be found on the Ranges & Rates Page. First time shooter? Click here for more information. All instructors at The OGC are NRA certified instructors, and most carry various other certifications that further enhance their skill set. We offer a wide variety of training to meet your needs for further information on classes & training offered please see the Classes & Events Page. Our facility is setup to host private events! Whether you’re hosting a corporate event, birthday party, or bachelor party, The OGC’s classroom, lounge, and range bays can be rented by the hour. Facility rentals also include additional benefits: Dedicated Range Safety Officers, Free Rental Guns, and Free Targets. Contact us for pricing and to book your event today! You are called, “The Orlando Gun Club”, must I be a member or are you open to the public? The Orlando Gun Club is open to the public, but offers various memberships with added benefits including: use of the member’s lounge, free gun rentals, range priority, discounts on ammunition, etc. What do I need to know in order to come shoot for the first time at The Orlando Gun Club? We have put together a first timer guide called, "What you need to know". Please read and review the information sheet thoroughly before you plan you trip to the range so you are prepared when you arrive. Link: WHAT YOU NEED TO KNOW INFO SHEET. What do I need in order to rent a gun at the Orlando Gun Club? If you do not bring your own firearm, then you need to be in a party of at least 2 or more people and you must have a valid form of government issued identification (State ID, Drivers License, or Passport). All firearm rentals require OGC ammunition. How old do you have to be to shoot at The Orlando Gun Club? Accompanied Minors need to be a minimum of 12 years old and must be accompanied by their parent or legal guardian at all times. Unaccompanied minors are not permitted at any time. How much does it cost to shoot at the Orlando Gun Club? At the OGC we offer a la carte pricing. It is comparable to ordering off of a menu at a restaurant. We cannot tell you how much it is going to cost until we know what you plan to order. As a way to help you determine your budget for your day at the range we have put together the following example price sheet for your reference. WHAT YOU NEED TO KNOW. Additionally, please see all of our rates on the Range & Rates Page. If I am licensed to carry a concealed firearm, am I allowed to carry it in your facility? Although anyone with a valid Concealed Weapons Permit is allowed by law to carry concealed firearms in accordance with Florida Statutes, we respectfully request that all firearms and magazines carried into our facility be unloaded and empty. What is appropriate attire at a shooting range? You should wear clothes you are comfortable in. For safety reasons (hot brass), flip flops and sandals, as well as low cut tops are not permitted in our range. Is experience handling a firearm required before I am allowed to shoot at The Orlando Gun Club? No experience is required. If you do not know how to properly handle a firearm, the friendly staff at The Orlando Gun Club provides safety instruction free of charge and can provide range assistance for a nominal fee. May I take pictures while I am at The Orlando Gun Club? You are allowed to take pictures provided that you are safe with all firearms. May I bring my own ammunition? How much is an FFL transfer? FREE for members / $33 for non-members (both inbound & outbound). All transfers (whether members or non-members) require a $7.00 FDLE background check fee to perform a legally required background check. First time shooting a firearm? Are you a tourist coming to shoot in sunny Orlando, FL? If so, please download our additional information below. Please review our “What you need to know information sheet” for pricing, rules and regulations. We offer a wide range of firearms for rental. Choose from pistols, shotguns, rifles, and more! Ammo for all calibers are available for sale. Appropriate range rounds are required for use on the ranges. ©2014 Orlando Gun Club. All Rights Reserved.